A few years back I commissioned a piece, Divertissement by Sy Brandon for multiple woodwinds soloist with piano, with the help of a Co-op Press Commission Assistance Grant. Brian Levels, who was until recently a doctoral student at the University of North Texas, has written a dissertation on the piece, which is now available through the UNT Digital Library. Be sure to check out the dissertation, and, of course, the piece. 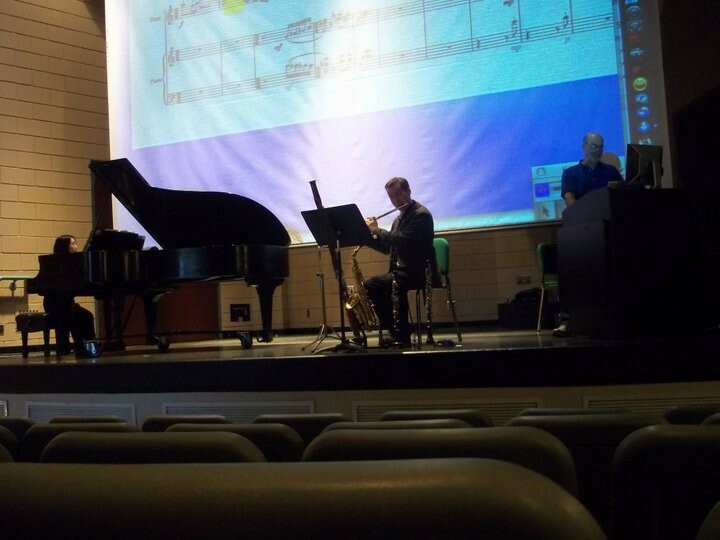 I’m pleased to share some audio from my Delta State University faculty recital a few weeks ago.The big event of the evening was the premiere of Sy Brandon’s Divertissement for multiple woodwinds and piano, which seemed to be well received. It’s gratifying to be involved in the creation of a piece that fills a gap in the small multiple woodwinds repertoire—something than can be played by a woodwind doubler, without having to bring in a concert band, a truckload of electronics, or obscure instruments. The audience seemed to enjoy the derring-do of the final movement, which involves six instruments. I’ve studied the Bonneau Caprice en forme de valse in the past and have had students perform it, but this was the first time I played it in public myself. Since I’m trying to balance a half-dozen or more instruments, I tend to shy away from pieces that seem too technical, and, in that respect, this was the riskiest piece on the program. I was mostly pleased with how it turned out. Sy Brandon’s Divertissement for multiple woodwinds and piano is now available for purchase. If you’re a regular reader, you know that I commissioned this piece with funding from a Co-op Press Commission Assistance grant, and you have already read my series of blog posts about the genesis of Divertissement. The piece is now available for purchase from the Co-op press website. It’s priced at an extraordinarily reasonable $6.95 for a PDF download (at the time of this writing), and U.S. customers can opt for a print copy for a still-affordable $16.95. The individual movements, any of which would make a charming short piece for a recital, are also available at just under two bucks apiece (PDF). I was pleased to have Dr. Sy Brandon, composer of the new work Divertissement for multiple woodwinds and piano, on campus at Delta State this week for a brief guest composer residency and an open rehearsal of the new piece. As you can see from the photo, I decided to play sitting down. The reason for this is a very quick switch from flute to piccolo—1.67 seconds at the marked tempo—that necessitated a lap to drop the flute into. The official premiere will take place sometime this fall. The composer, Dr. Sy Brandon, will be in residence at the Delta State University Department of Music on Monday, Feb. 28. The agenda (forthcoming) will include an open rehearsal of Divertissement (with pianist Kumiko Shimizu) and a Q&A session with Dr. Brandon. Dr. Sy Brandon has posted his work on the sixth and final movement of the Divertissement for multiple woodwinds soloist and piano. In some early communication, Dr. Brandon suggested that this movement, the “Galop,” be written for piccolo. I was happy with this idea, and even dusted off my piccolo to start getting my chops in shape. But by the next day he had hit on a new idea that I liked even better: using the sixth movement to bring back each of the five previously-featured instruments in one tour-de-force finale. While I was pleased to have this piece include a chance to show off my skills at switching instruments on the fly, I did think that this might limit the number of doublers who could perform the piece. I like the idea of a piece custom-tailored to my specific skill set, but, on the other hand, I would like to see the piece become a significant addition to the limited repertoire for woodwind doublers. The problem, of course, is that a “doubler” might play any combination of instruments, and a piece for five specific instruments does drastically narrow the field of capable performers. My initial hope was that the piece might be adaptable to individual doublers’ abilities, either by selectively omitting movements or by providing alternate instrumentations. Sy Brandon has shared his work on the fifth movement of Divertissement, the newly-commissioned piece for multiple woodwinds soloist with piano. This movement, “Romanza,” features the oboe, and completes the total count of five woodwind instruments. Dr. Brandon has indicated that there are six movements planned, and I know he has been toying with the idea of the sixth movement involving switching between instruments. It has been really interesting to see this piece take shape, and I hope you are keeping track of what he is doing over at Composing Insights. He makes his process very transparent, and, with each post, solicits comments from his readers about the compositions in progress. I have left some comments and gotten some insightful responses, and have even seen some of my suggestions incorporated into his revisions. I know he would welcome additional comments, especially from skilled doublers who might be interested in studying and/or performing this piece when it is completed. Go take a look, and add something to the conversation. Sy Brandon has posted his work on the fourth movement of Divertissement, the new piece for multiple woodwinds soloist. The movement, “Marche” for clarinet and piano, is energetic and full of humor. You can take a peek at the score and hear a (synthesized) recording. I’m excited about the progress on Divertissement, the new piece for multiple woodwinds by Sy Brandon. He has posted his work on the third movement, the clever Valse for bassoon and piano. I’ve submitted a comment at his blog regarding some matters of tessitura. Dr. Brandon keeps comments under tight moderation, so my remarks may not be available yet.